In award-winning author Simon Van Booy's fantastical sequel to Gertie Milk and the Keeper of Lost Things, Gertie, Kolt, and Robot Rabbit Boy continue their adventures returning missing objects throughout history while trying to find out what happened to the imprisoned Keepers of Lost Things. Ever since Gertie Milk arrived on Skuldark, the mysterious island home of all lost objects, she's felt like something was missing. According to Kolt, her mentor and fellow Keeper of Lost Things, the island used to be filled with Keepers tasked with returning missing items throughout history. But now the only three left are Gertie, Kolt, and, Robot Rabbit Boy--a bumbling but lovable Series 7 Artificial Intelligence Forever Friend. So when Gertie learns that the missing Keepers have been imprisoned by the Losers, their unsavory adversaries, she decides to make it her mission to rescue the kidnapped Keepers and return them to Skuldark. But that proves more difficult than she'd imagined since her missions to return lost items don't seem to be taking them anywhere near the missing Keepers. Plus, it doesn't help that the Losers have an evil master plan much worse than their last one. This time, the entire future of the universe is at stake. 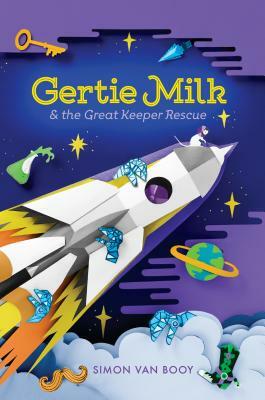 Fueled by delicious cakes, jars of lemon curd, and plenty of Skuldarkian seawater, Gertie, Kolt, and Robot Rabbit Boy must travel through time (and outer space) to save their island home and rescue the Keepers--before the Losers manage to capture them all. Simon Van Booy is the British American author of the first book in this series, Gertie Milk and the Keeper of Lost Things, as well as several adult novels, including The Secret Lives of People in Love, Love Begins in Winter (winner of the Frank O'Connor International Short Story Award), and The Illusion of Separateness. Simon teaches part-time at the School of Visual Arts in Manhattan. In 2013, he founded Writers for Children, a project that helps young people build confidence in their literary abilities. Raised in Wales, Simon currently lives in Williamsburg, Brooklyn, with his wife and daughter. You can visit him at SimonVanBooy.com or follow him @simonvanbooy.